How do I use the Help application? The Help application allows you to get support and recommendations customized to your device. 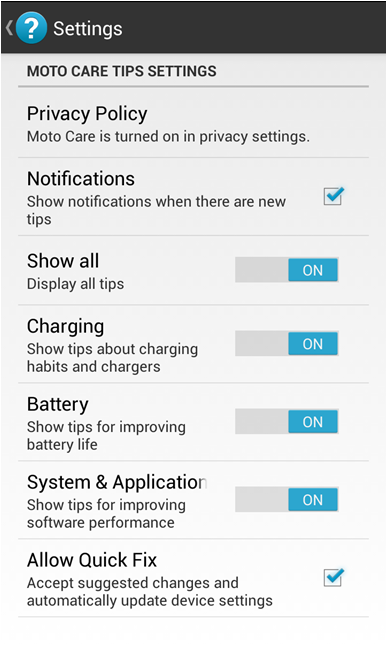 You will be prompted to enable Moto Care Tips during the initial setup. If you did not enable Tips at that time, you can enable later by going to Settings > Motorola Privacy > and turning on Moto Care. To customize how Moto Care Tips works for you touch > Settings > make desired selections. It is possible now to launch LogMeIn from the Moto Care app. The Moto Care app will take the user directly to the app on the Google Play store, or if the app is already on the device, it will launch it directly.